Android smartphones are famous world wide for having various kind of useful applications and games. Since we download apps that we need like we use messengers, photo editors, calling apps, launchers and other security apps. We have already listed out best android apps. Android is a functional OS but not as secure as it should be. As we can easily download paid android apps for free, Which show that android is probably not secure. Normally we use pattern lock to protect phone for others or we even use some applications. It is a very easy and simple way to secure our personal mobile phone data with pattern lock. We have to just draw a pattern and that’s it. As we don’t have to bother about putting numbers or characters for password. Because we can easily forget numbers and characters as compare to pattern lock, it is a very rare case that you may forget your pattern lock. As normal we utilize gmail account in play store it turn out to be anything but difficult to reset however in the event that you don’t have an email deliver to reset it. So don’t stress, the individuals who overlooked their android design bolt can undoubtedly open example bolt without losing their own information. As every one of these examples can without much of a stretch circumvent just by doing some exertion. We presumably reset our telephone to evacuate these example bolt. Be that as it may, shouldn’t something be said about in the event that we need to rather Unlock Pattern Lock On Android Without Losing Data? Try not to stress you are at a correct place. Here we discovered a few techniques through which you can open example bolt any of your android cell phone. We will disclose distinctive strategies to open android cell phone design bolt without losing information. So pick which you discover simple to do. How To Unlock Pattern Lock On Android Phone. Method 1:- Unlock Pattern Lock On Android Without Losing Data. A memory card for android device. You android device either locked by pattern lock or password lock. Step 1. After downloading Aroma File Manager, place it in your memory card (SD card). Then, insert the memory card into your locked android device. Step 2. Open Stock Recovery Mode with reboot your android device and pressing Power Key and Volume up key simultaneously. Different phones may have different methods to open stock recovery mode so if you face any problem Google it. Step 3. After entering into recovery mode use Volume+ and Volume- buttons to scroll up and down. For select use middle button. Step 4. From there click on “Install Zip from SD Card” and give path to install “Aroma File Manager” from SD card. Step 5. After installing, it will open in recovery mode. Step 6. From the Aroma File Manager navigate to settings >> go to bottom and click on “Automount all devices on start” and then exit. Step 7. Now again click on “Install Zip from SD Card” and give path to install “Aroma File Manager” from SD card. Step 8. After this you will get “Aroma File Manager” opened again. Step 9. Now navigate to Data Folder >> System Folder and find >> “gesture.key” or “password.key” for pattern lock or password lock respectively. Step 10. Delete that any one file and then exit aroma file manager and reboot your android device. After rebooting you will notice that password or pattern lock is not removed. But don’t worry draw any pattern and you will open your android device but remember or note that pattern because it will be saved. Method 2nd:- Unlock Android Pattern Lock. 1. 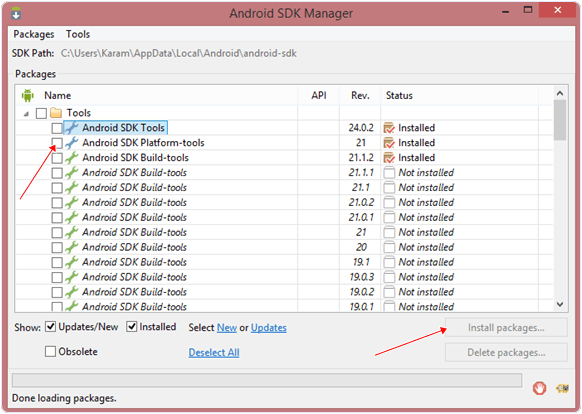 First of all Download Android SDK and here we will show you How To download and install Android SDK Tools. 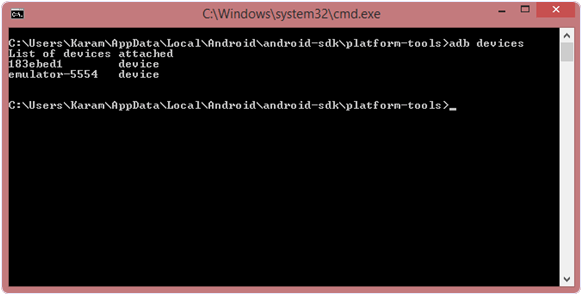 Download and install Android SDK Tools for run ADB commands. Open the given page and then select platform according to you download and install it. After installing open it, unchecked the other packages and check Android SDK Platform-tools and then click on install packages according to the image given below. 2. So the other requirement is USB Debugging should be enabled before your android device was locked. 3. The process will probably not be helpful if you don’t have specific and compatible drivers for your phone. So you should be very careful While installing your device compatible drivers. Steps To Unlock Android Pattern Lock. Step 1. Connect your locked android phone with PC/Laptop via USB. Step 2. 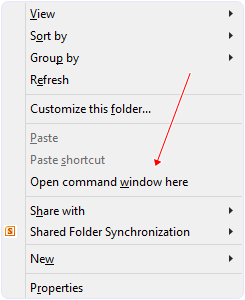 Then, Open folder where you installed Android SDK Tools Users >> App Data >> Local >> Android >> Android-SDK >> Platform-Tools and then click on blank space hold shift and click right mouse button and select “open command window here”. Step 4. Once you done the above steps, you have to reboot your android device. Now its all done. After rebooting your device you will see the pattern lock disabled. So in this method USB Debugging should be enabled before lock because it is a must. If it is not enabled then you cannot proceed further steps. Method 3rd:- Unlock Pattern With Factory Settings (Data Will Lost). Since, in the above methods we have used PC/Laptop, we downloaded software and we usedsome commands. But if you do not have a PC/Laptop or your device did not have USB Debugging enable, then you can follow this method. NOTE:- IN THIS METHOD YOUR ALL DATA WILL BE LOST. SO IF YOU DO NOT WANT TO LOSE YOUR DATA THEN DON’T FOLLOW THIS METHOD. Step 1. First of all, Switch off your Locked Android Device. Step 2. Then, boot your Android device into “Recovery Mode” using specific keys by holding power key and volume up key simultaneously. Select “Factory Data Reset” option and give “Yes“. Select “Wipe Cache Partition” to wipe cache data. Step 4. Then, Reboot your device. Step 5. All Done ! hence, your device will start from the scratch. In conclusion, we feel that you have learned some interesting facts about how to unlock pattern lock on android. But few people may use this to hack but you should rather use this in a right way to help someone, or yourself. If you have any question leave your comments below.